I am sensationally drunk on admiration. Some books exist in this world that -- once I read them -- leave me wishing a simple "in awe" would suffice as a complete review. For all the years I've lived: where, oh, where has Rachel Hartman been? I sat for days staring at the computer as my review didn't write itself, like my brain was sucked dry of words. An unintelligible but love-struck sigh came out instead, and I began to wonder how I'd get my vocabulary back. Impressionable for its descriptive world and striking characters, Hartman gives one of the most refreshing stories I've had the pleasure to read. Divided between voice, structure, and artistry, clever allure runs equally. Out of all the reading I do, high fantasy is not a genre I typically aim to read often (let alone get excited for). Like a bug, I caught the pre-release hype and couldn't help but force this book onto other people's to-read lists. Then, once the book was released and I started reading, my tongue threatened fireballs of rage to anyone who dare disagree that Seraphina is enjoyable. My goodness, God forbid people think different thoughts and have different tastes than me, because that's wrong. In fact, I remember a time before that. There was no light, but there was music; joints creaking, blood rushing, the heart's staccato lullaby, a rich symphony of indigestion. Sound enfolded me, and I was safe. Thus begins Seraphina Dombegh's venture into life. Banned from the outside world by an overprotective father, the young protagonist grows into an exceptionally smart and curious individual. Keen hearing and inborn talent, one out of many rules she is expected to obey becomes the source of stewing irritation: she is forbidden to play music. "Half lawyer," Seraphina "always noticed the loopholes." 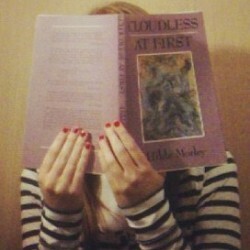 Realizing that no one forbade self-instruction, lessons began. Determined, Seraphina intended to shame her father into allowing music lessons by an "impromptu performance" -- a thought and hope that resulted in a broken flute and a terrified, upset Mr. Dombegh. Soon after, truth behind her father's fear and unwavering vigilance surfaces as her life undergoes an irreversible change. In that moment, Seraphina realized how different she truly is and the lengths she must go to keep it secret. Disgusted by what she is and forced to conceal it, Seraphina locks in a constant struggle between separating herself from others but feeling desperate to withdraw from loneliness. Highly intelligent and often bold, she doesn't crouch in fear. She rises to the occasion and willfully takes courageous first steps when others hesitate. Finally free, however, to develop her knack for creating musical beauty, Seraphina trains under the saarantras Orma. (Saarantras: a dragon in human form.) As her ability blooms, a reputation steadily builds, and anonymity is no longer and option once she gains entry into castle walls. Assistant to Viridius, the court composure, and tutor to crowned Princess Glisselda, word of the greatly talented Seraphina spreads. Due to her younger years of home-bound isolation and instinctual reminder of self-protection, this musical prodigy presents herself as socially aloof. Regardless, her oddities and status work hard for the very attention she wishes to shy away from. Interests rouse, and with it brings Prince Lucian Kiggs: friend or foe? Dragons are not majestic, beautiful creatures that instill fear by the sheer power they possess. Instead, dragons are animals of nonchalant, calculating, and cunning nature, detested by many humans. Likewise, humans are also thought as loathsome: stubborn to die, humans multiply and scatter and ruin a dragon's hunting ground. Yet emotions (messy as they are and foreign to the indifferent dragons) and the human aptitude for art make people interesting. Hence, these qualities lean in favor of establishing an agreement between the species. After forty years of peace among dragon and humankind, the body of Prince Rufus is discovered and seemingly decapitated by a rogue dragon. As Treaty Eve draws near, tensions rise and jeopardize the union upheld by Comonot's Treaty. Heading the murder investigation is Prince Lucian, who -- intrigued by her knowledge -- wraps Seraphina inside the mystery as a fellow partner-of-justice. Together, as they work to solve the case, the two discover that Prince Rufus's death is only the first tipped domino in a plot designed to capsize the peace. But the question remains: as reasons behind her knowledge on dragons becomes strapped under scrutiny, how far can Seraphina's lies stretch without becoming too entangled? Should the secret she bears see light, it could mean execution and endangering her family. 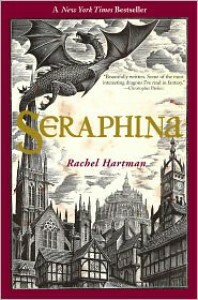 Seraphina is a richly enchanting debut novel that plants the reader right next to the heroine's side. Hartman's creation proves itself a complex, delicately built world plagued by hostility and discrimination that undermines peace. This book explores what it means to be different in an intolerant environment, a place predisposed to greet with prejudice. Delving beyond self-acceptance, Hartman touches on deserving respect not for what you are, but because you are sentient. Seraphina questions the inner make-up, the actions and beliefs that define someone, and turning away from societal bias to accept the self. The world inside myself is vaster and richer than this paltry plane, peopled with mere galaxies and gods. For those who have yet to discover the prequel: read away! At 19 pages, you can read The Audition quickly -- but! The Audition is less of a prequel to the series. Rather, it is a story that narrates how Seraphina gains entrance into the palace by becoming Glisselda's music tutor. For anyone who read Seraphina and fell in love with Hartman's craft and characters, additional appreciation for the quirks of Orma, Glisselda, and Viridius will be felt. I recommend reading the prequel after Seraphina for this reason, but The Audition can still be read, understood, and enjoyed by people who have not read book one. Meanwhile, I wait on seconds to tick by, months to pass, and the new year to swing full-force like a bulldozer coming to shatter 2012. Come at me, Shadowscale, because my bookmark is ready. This review and more can be read at Midnight Coffee Monster.